From Roses to Rainbows: Got Doughnuts? We don't have a Krspy Kreme either, but we do have a good local shop. I loved this piece-it's as delicious as a fresh warm doughnut! Mmmm ... there is absolutely nothing like a fresh from the fryer doughnut. Nothing. Linda, this is really really cool, because one part of Kelly's 11th birthday party next week will be taking her and her 5 slumber party guests to KRISPY KREME donuts. Here they make the donuts LIVE from 5:00 to 10:00 a.m. and from 5:00 to 10:00 p.m. And ALL the activities are surprises, Kelly doesn't even know. And actually, I don't even know what one part will be, but I'll get it figured out -- got 8 days in which to do so. Great! 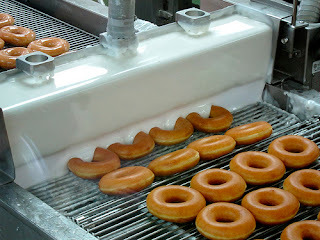 Now I want Krispe Kreme donuts and we don't have them here anymore! Your post made me think of my dad, and how when he'd get out of work around 11:00 p.m., he'd always stop at the Shipleys by our house and bring him a dozen freshly glazed donuts with a carton of chocolate milk for me. He didn't do it all the time, just when I asked him to. -Thanks for bring this memory to light. I had forgotten all about it. Patricia Lynn- Sorry you don't have a shop nearby. Fortunately ours is 10-15 min. away. Valerie - Not much beats a fresh warm doughnut. That's quite a compliment. Thanks. Alexandra- I seem to be making folks crave doughnuts - myself included. I guess every place as a special doughnut shop. Oh, and I really look forward to the trip and taking the pictures. Morgan- They are tasty, indeed. Jannie- Life is full of coincidences. I'll be looking forward to the party pics. Yvonne- "Now I want Krispe Kreme donuts" Me too, but I can't eat them as often as I'd like. Glad I could bring back such a pleasant memory. Thanks for visiting. fabulously done! And now I want some doughnuts too! Babs - While I think Krispy Kreme makes the best doughnuts ever, I'm sure you have some great doughnut shops, too. Cait- I certainly don't get them as often as I'd like. I think I've made everybody hungry! Anji- I'm sorry you only get to imagine. :( They now have a maple iced glazed that is soooo good. Meleah- After having written this, and read all the comments, I want some too! Connie- Yes, I think you were at that party. Those were good times, but...we are all making new good times, and still get the occasional Krispy Kreme doughnut.